Sump Pumps are installed in your basement or crawl space of your home or business to keep water from flooding those areas. If your home or business is in a low lying area, you may have water seepage or full out flooding of your basement or crawl space during heavy storms or with rapid snow melt. 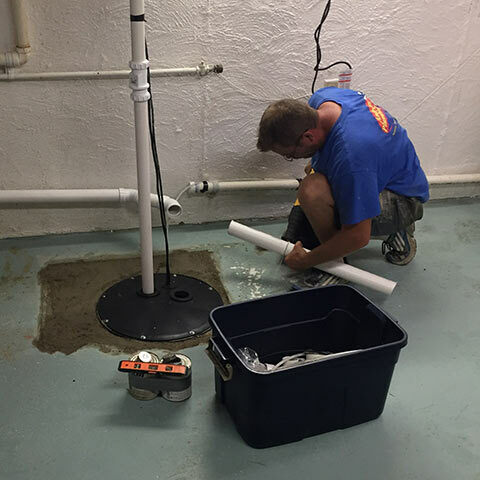 A Sump Pump is installed in the lowest part of your home or business to pump out water from beneath the structure to prevent it from entering your home or business. Sump Pumps fall into one of two categories, pedestal or submersible. Pedestal Sump Pumps generally last 25 - 30 years, are less expensive to repair, but have the motor in plain site. Some people prefer that the pump and motor be submerged. In this case the motor is encased to prevent electrical shorts, and is submerged with the pump. In both cases, the Sump Pump removed water from beneath your home or business and moves it to a place where it will be less problematic for you. A Sump Pump is usually installed in a sump pit. Help your Sump Pump run longer by checking the pit periodically to remove debris. Remove any debris in the sump pit or basin. Insure that the pump is standing upright so that it functions as intended and when necessary. Pour a bucket of water into the sump pit or basin to make sure the pump activates quickly, automatically, and that all water is removed from the sump pit or basin. submersible Pumps should be removed to have gravel and sand removed from the bottom grate. Your Sump Pump is a piece of mechanical equipment and will wear out, eventually. When you notice that your sump pump is not moving water as quickly, or doesn't work at all, call Andrews Plumbing to assess the situation. Sometimes the solution is as simple as replacing parts like a float or power supply. We will be happy to look at your pump and give you options for repair or replacement.